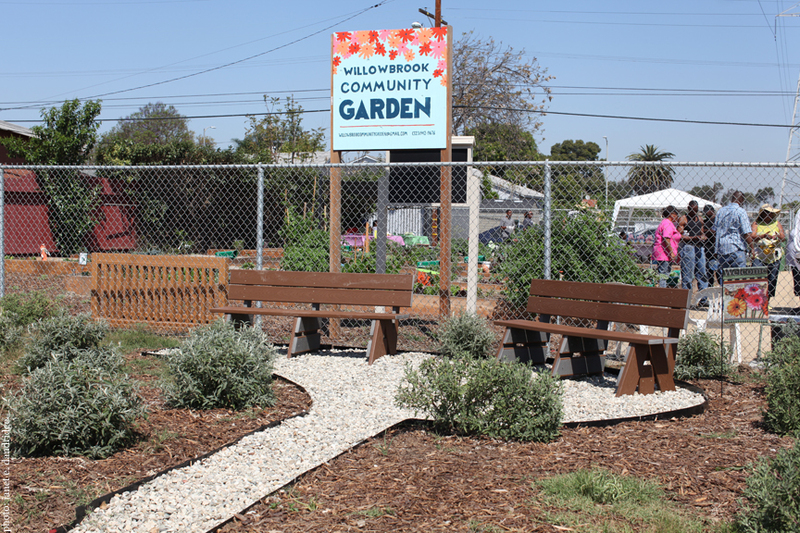 The Willowbrook Community Garden is a project that was fostered by the Los Angeles Community Garden Council in October 2014 and since then has been empowering an underserved population of Americans. The location of our garden was originally just an empty lot in which the community kids referred to as the field. Now entering its first year, the garden is proving what collaboration can do to bring about a change within the community. With support from garden and community members the garden has become a focal point for children and parents. Upon the opening of the garden, there are now people walking its streets, riding bikes and scooters, and learning what it means to live healthier lives by growing their own fruits and vegetables. The economic and spiritual changes are tangible for the people who live around the Community Garden as well as the reduced crime. The garden has become a valuable asset in the Willow brook Community with its friendly aesthetic, which has encouraged a positive life change in local residents. It seems to have resubmitted the confidence of neighbors and has brought the small community closer through bi-monthly meetings and harvesting together. What was once an empty field has now shifted to a center of growth, hope, and most importantly, a community. The Willowbrook Community Garden is located at 664 East 120th street in Los Angeles.